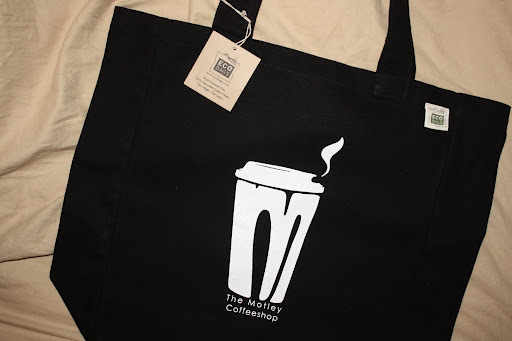 Everything I know about Motley Coffeehouse is straight from their blog and even with the little information I’m going on, I’m pretty sure it’s the coolest place ever. Something about the combination of “largest all-women-run student organization this side of the Mississippi,” “biweekly vegan cookies,” “live music every Sunday and Thursday,” and “100% recycled cotton canvas ECOBAGS® ” forms a tasty little dream-like oasis in my mind. Plus, given the disparity between current New York and Claremont, California climates…Motley girls, I hope you’ve got plenty of coffee a’brewin’ ’cause I’m on my way! If you’re in Claremont, or even California for that matter, make a trip to Motley Coffeehouse and let me know if my fanciful visions are for real! And check out their cool new ECOBAGS®.